Broken Bootlegs is a series covering unlicensed games (also known as bootleg games) for mainly 8-bit and 16-bit consoles. This week’s edition covers possibly one of my favorite Famicom fighters: World Heroes 2. During the prime of fighting games in the 90s, there were a few game characters that I wanted to see duke it out on the screen, including Mario and Sonic. Sadly, this wouldn’t be realized to its fullest extent till Super Smash Brothers Brawl. There was one bootleg game that fulfilled some of those fantasies, though. Not to be confused with game that shares the same name released by AES and SNK, World Heroes 2 by Cony Soft pits 12 playable fighters against each other in all it’s bootleg glory! Trying to be unique in 1994, Cony Soft made another entry into their list of fighting games with World Heroes 2. Unique if only being able to play battles with characters like Ryu, Mario, Bowser, Goku, Hagar, and Sonic, that is. Unfortunately, it shares the same problems with other games of the time due to common issues found in bootleg games. One of the biggest glaring issues are the poor controls and player AI. Combine the two, and it would make for very cheap and quick losses. While this is an issue, it is possible to play though and beat the game. Graphically, the backgrounds look decently good, and even have a decent amount of animation to them. Conversely, there is a lot of flicker on fighter sprites, which can be a bit disorienting. While most of the sprites are pretty faithful conversions, the ones for Mario, Bowser, and Sonic are out of place due to custom sprites being used for them. The music in World Heroes 2 is actually somewhat decent with trying to replicate some of the character’s theme songs. The sound effects overall are not bland, but not something that stands out for a Famicom fighter. 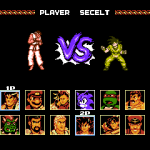 As stated earlier there is a decent fighter roster, and most of the characters have accurate movesets, surprisingly. While this is an average bootleg fighter, it still stands as one of my favorites due to the fact that it’s more of a unique game, similar to what Kart Fighter is as well. It’s fun to play with a friend, even with the frustrations of poor controls. While it’s no Smash Bros, it’s something interesting that came out back in 1994. With that said, World Heroes 2 would be a great game to add to any collection if you can find it, whether you love bootleg fighters, or are into collection more obscure games featuring Mario or Sonic. World Heroes 2 GameplayHave a suggestion on what should be covered for future Broken Bootlegs entries? Let us know on Twitter and Facebook!